As soon as the snow melts, it will be time for off-road fans and ATV/Jeep lovers to once again hit the trails for some iconic 4-wheel trekking. There are some great events and opportunities coming up soon, and 2018 is shaping up to be a stellar year for some truly awesome trail riding. First of all: location, location, location. Last summer, in the heart of off-road season, Road & Track magazine compiled a list of some of the best-loved routes and off-roading trails in North America. We’re sharing these gems with you now, courtesy of the R&T editors, so you have plenty of time to plan and prepare yourself and your rig for maximum adventure later this season. If you’re not familiar with all of these destinations, they are a must-review for your spring and summer off-roading plans. Running from Bullhead City, Arizona to Newberry Springs, California, this iconic trail runs a full 140-miles and is loaded with historical spots to check out along the way. There are few spots in the continental USA as beautiful as the Pacific Northwest. This route serves up truly diverse terrain—from deep green rainforests in the Cascade Mountains to the high desert of Eastern Washington. This impressive 63-mile trail crosses the San Juan Mountains, with two dramatic 12,000-foot passes, fascinating ghost towns, loads of scenic eye candy and absolutely breathtaking vistas. A 750-mile trek that starts north of Arizona’s border with Mexico and runs all the way up to its border with Utah, this back country trail offers up rich regional history, deep sand, Ponderosa pines and LOTS of picture perfect cacti landscape. Not for the faint of heart, the Dalton Highway – also known as “The Haul Road” – runs for 414 miles from the Yukon River to Prudhoe Bay. This trail is for experts only – it’s full of potholes and Grizzly bears, but will be a never-forget adventure for serious off-roaders with the right gear, preparation and experience level. Starting outside Elk City, Idaho, this corridor takes about two days to traverse, driving at a slow pace, en route to Darby, Montana. The history of the 250-mile El Camino Del Diablo—dubbed “The Devil’s Highway”—is rooted in the 16th century, when conquistadores, settlers, missionaries, and miners alike frequented it on foot. It starts southwest of Ajo, Arizona, and continues along the Mexican-U.S. border. Stretching 50 miles through beautiful British Columbia, the Whipsaw can be conquered in one exhausting, dawn-til-dusk day, but it’s worth a much slower drive to absorb and digest the magnificent Canadian scenery. Arches, towers and buttes. The White Rim Trail in the Canyonlands National Park runs 100-miles and deserves a solid two-day trip. Expect some great views of the Colorado and Green rivers and lots of impressive, 35mm camera-worthy sandstone geology. As noted in some of the descriptions, and as with any off-road adventure, these trails involve fluctuating degrees of difficulty and require varied skill levels. Some are more moderate. Others are downright dangerous and not appropriate for newbies without serious experience and the proper equipment. Read R&T’s full story here to get the detailed lowdown and safety recommendations for each. It’s also important to get informed and prepared. Whether you like to stick around the trailhead or go deep into approved terrain trails to get lost in the beauty of the mountain, off-roading can offer something for everyone—but proper preparation is always the key. 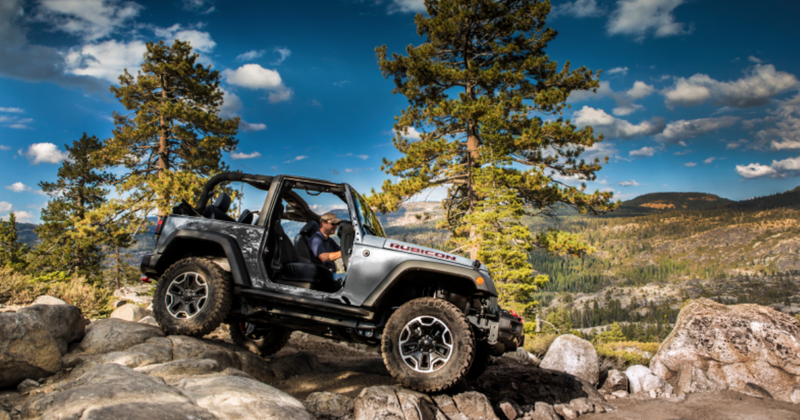 Get the right vehicle—anything from a highly modified Wrangler to an even more sophisticated custom build if your journey demands it—and know your limitations. Even the toughest, most veteran drivers can be knocked out and derailed by unexpected boulders, mud ditches and fallen trees that weren’t visible on the last trip. Get the facts and have the right gear to camp out until you’re rescued. Also, unless you want to throw away your investment on that first outrageous journey, make sure to protect your vehicle with a coat of Bullet Liner’s durable spray-on sealant. It’s not just for bedliners, but for your entire Jeep or ATV (exteriors AND interiors) – and will keep your trail master from getting destroyed by flying mud, rocks, debris and extreme weather conditions. And for anyone headed off-road, always EXPECT to get stuck. Having the appropriate tricks and tools handy to get out of an unanticipated mess makes the difference between an exhilarating vacation and a trip to nowhere. This requires serious advance knowledge and training that should never be taken lightly. Visit credible online enthusiast visit forums and consider taking training classes (like those hosted by local 4X4 clubs) to learn firsthand how a certain trail can shape up in real life situations—from those who have already made the journey. Never rely on a map or guidebook to tell the whole story. Additionally, always watch and follow weather conditions – and for the tougher trails, consider traveling in a two-car formation with a more experienced driver. Take proper radio communication for an unexpected incident and always make sure you have a means to get in touch with emergency assistance. DO NOT EXPECT TO RELY ON CELL PHONE SERVICE. IT’S HIGHLY UNLIKELY TO EXIST. For those who enjoy the structure of traveling with an organized group, consider checking out these seasonal upcoming events in early spring. However you plan to travel, always have fun out on the trail and enjoy all that the off-roading experience has to offer – a true “thrill on wheels” like no other…just waiting to be discovered as soon as the last snow thaws.